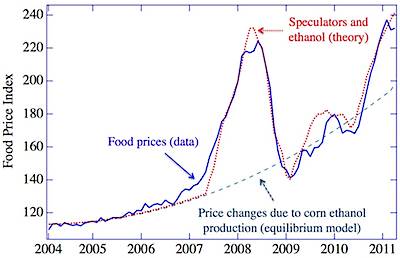 A new analysis of sudden rises in global food prices puts the blame on biofuel policy and mortgage-meltdown-style speculation, which may have fundamentally changed how food markets function. Many other explanations have been proposed, and the latest analysis — a series of mathematical models and statistical evaluations that seem to match theory with real-world patterns — is not conclusive. But it does make a strong case. Bar-Yam and the NECSI team, whose analysis was published Sept. 21 on arxiv, work at the intersection of social phenomena and network analysis. In earlier research, they’ve explored the global economy’s changing structure and early-warning signals signals that may precede crashes. More recently, they’ve studied how social unrest may have been fueled by food price spikes in 2008 and again in 2011. It’s not only the rise in food prices that’s proved troubling, but the rapidity. Shifts have been big and sudden, in stark contrast to the generally slow fluctuation of food prices since the mid-20th century. Among the possible causes put forward by economists are drought, meat-intensive dietary habits and market hypersensitivity to supply and demand. Another is corn-based biofuel: In less than a decade, some 15 percent of the world’s corn production has been converted from food to fuel. Perhaps most controversially, some economists have blamed a flood of speculators betting on the rise or fall of food prices. Speculating on food isn’t new, but it was long restricted to farmers and companies involved in food production. For them, speculation was a classic form of hedging: A farmer could, for example, make a bet that crop prices would fall. If they didn’t, he’d benefit from his harvest’s high prices; but if they did fall, winning his bet would offset the losses. Speculation was, on the whole, a stabilizing force. In the late 1990s, however, a financial industry-led push for deregulation — which would later result in the Enron debacle and the California energy crisis, and the 2008 mortgage meltdown — changed how food speculation worked. Anyone could participate. Bets on food were suddenly made by investment companies who could package and repackage their bets into the sorts of derivatives made famous by the mortgage crisis. According to some economists, this disconnected food prices from basic laws of supply and demand, and made them prone to wild swings. But others disagreed, saying the mathematical signs of cause-and-effect were hazy or absent. Bar-Yam’s and colleagues approached this morass with a series of mathematical models designed to simulate the trend-following investment behavior of speculators and food producers. Key to their models was a link between food prices among speculators and the so-called spot price of food at markets where actual commodities, not their hypothetical future values, are traded. Some critics of the proposed speculation-food bubble link say spot prices are established independently, from moment to moment, in isolation from any speculative influence. But when Bar-Yam’s team phoned people in the business, at granaries and the U.S. Department of Agriculture, they were told that spot prices are set in reference to the futures market at the Chicago Board Options Exchange. With the link to speculation established, the researchers let their model run. What resulted was a pattern of month-to-month prices similar to the peaks and valleys seen in real-world food price fluctuations since 2007. However, speculation didn’t replicate observed long-term, year-to-year rise in food prices. Models are necessarily pale, oversimplified representations of complex reality, of course, and retrospectively replicating a dataset doesn’t prove the researchers’ model right. But it seems to fit better than other proposed explanations for rising, volatile food prices. When Bar-Yam’s group looked for a statistical connection between the 2008 spike and drought in Australia, none could be found. Neither could a link be found to rising grain demand, which has come primarily from China and India, both of which met their needs by increasing grain production internally rather than buying abroad. Another plausible explanation, rising oil and energy prices, didn’t hold up to rigorous statistical analysis. Finally, the researchers found no evidence that global food markets have simply become extra-sensitive to tiny changes in supply and demand. 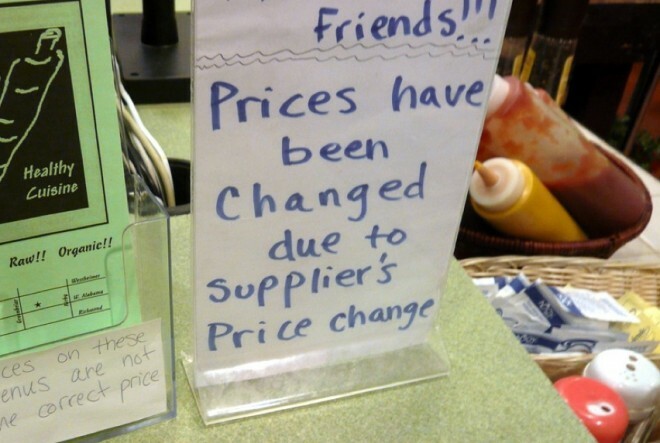 If anything, the basic laws of supply and demand appear temporarily suspended: Supplies increase but prices don’t fall, and demand goes unmet. While slowly rising prices are a problem, however, the rapid short-term bursts are more troubling. In the last decade, those bursts occurred only after 2007, a time when investors moved money en masse into commodities. That timing fits with another finding of Bar-Yam’s model: Some speculation is fine, even beneficial, but too much makes a market prone to instability. Brookings Institution economist Homi Kharas called Bar-Yam’s model “carefully done,” and said it “provided solid empirical analysis” that diagnoses of speculative influence are correct. However, he warned against attaching too much weight to a model. Food price bubbles also aren’t new, Kharas said. “Prices today are roughly at what they were in the mid-1970s,” Kharas said. “At that time, nobody had heard of these futures, these index-traded funds. How do we know are new changes, and not a return to things in the past?” But Richard Cooper, a Harvard University economist who in the mid-1970s studied that bubble, said speculation by Russian grain buyers probably did fuel that bubble.